The Colwell-Janaceks do the Great Loop!! ￼ ￼ THE PLAN Since Jeff turned from a canoeist and bought a 40 horse outboard motor 10 years ago, he has been dreaming of trips. We had a wonderful cruise to Sitka, Alaska up the Inside Passage in our 26 foot coastal cruiser, Sabael, in the summer of 2003. 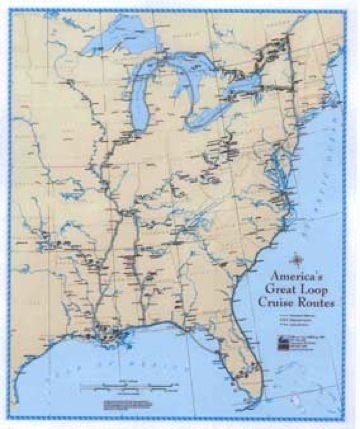 The Great Loop started with an entry about the trip in Jeff’s “life list.” Sally decided if we were going to do the trip with the boys, we had to go this year when they would be in 10th and 8th grades, before high school was too important. Jeff, who will do just about anything to advance family accord, especially if it involves buying boats, promptly found a trawler in Maryland and the project began. THE BOAT THE BOAT Adiron Adirondack is a 1997 Monk 36 Trawler, which we purchased in Chesapeake Bay in April 2005. We brought him home up the Intracoastal Waterway, up the Hudson and through the Erie Canal, across Lake Ontario, up the Trent-Severn Waterway, and across Lake Huron, Lake Superior and home to Bayfield, Wisconsin and the Apostle Islands, where he’s been in charter. He has a forward v-berth cabin with a head (a sink and toilet), a saloon with a steering station, L shaped settee and table and galley (the kitchen) with a four burner propane stove, oven, double sink, refrigerator/freezer and not quite enough counter space. The aft cabin has a double walk-around bed, a head and separate shower. He has a single Cummins diesel, a big diesel generator, GPS chartplotters and radar, heat and air conditioning, a stern thruster and a new, state-of-the-art electrical system. Wondering about that gender issue? It’s not a mistake. We are attempting to reverse years of discrimination against boy boats and call him a he, but we will let him choose his own course in the matter. The People Captain Jeff is a retired police officer and investigator for the state with a 50 ton Coast Guard Master’s license, which he uses to take people out for charters on Adirondack. Sally, our medical officer, is a pediatrician. 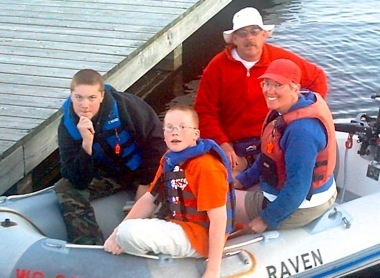 Able Seaman David is 15, quiet, a voracious reader, a good backpacker and cross-country skier. Able Seaman Adam is 13, also a reader, but talkative with a good sense of humor.